Quickly find information in files and folders across your computer or network, even if you do not know in advance exactly what you are looking for. PowerGREP's rich Perl-compatible regular expression support allows you to search for virtually anything by specifying the form of what you want, and let PowerGREP find the actual text matching that form. PowerGREP's documentation includes a detailed regular expression tutorial, with many simple and complex examples. Search through plain text files such as source code, letters and correspondence, server or system logs, reference texts, historic archives, etc. Search through through binary files, Unicode files, UNIX and Mac text files, files stored in zip archives, Microsoft Word documents, Excel spreadsheets, Acrobat PDF files, etc. Don't limit yourself to getting a list of files or search matches. Extract useful information from large sets of data or heaps of documents. Distill statistics and knowledge from all kinds of log files or archives. Perform comprehensive search-and-replace operations across large numbers of files for easy maintenance or fast editing of web sites, source code, reports, etc. Preview and inspect the results of the search and replace before actually modifying files. Replace or revert individual search matches in a full-featured file editor. Stay safe with a variety of backup options. Undo changes or clean up backup files in the Undo History. Save PowerGREP actions and invoke them from the command line to automate recurring tasks. 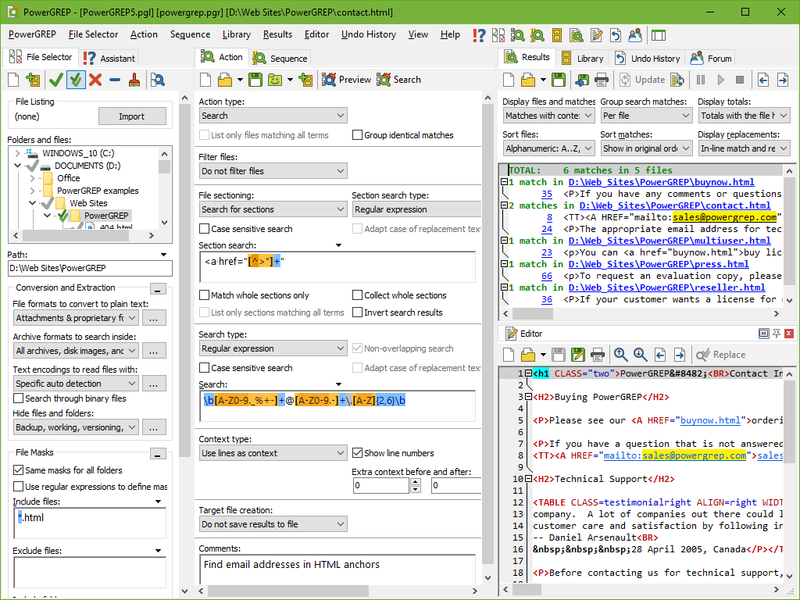 Developers can integrate PowerGREP actions and results with enterprise software through PowerGREP's open XML file formats.